Have you been tricked yet? I saw a story on the news about a high school that told students that prom had been cancelled due to bad behavior. It was only after administrators saw students crying that they informed the students that it was only an April Fools' joke. Poor students! Be sure to read to the end of the post today for an extra special April surprise. Every season, we pour over catalogs and magazines to review the new trends for fashion. Many people update their wardrobes every season, but in this economic climate, it is smart to make purchases wisely. Really, good preppy peeps always make purchases wisely and choose quality pieces that last for generations, but you already know that. Although good things like mother's pearls never go out of style, you can use jewelry to update your wardrobe and give it a boost at a very reasonable cost. 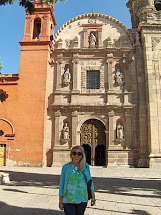 I've scouted out some of the hottest trends in earrings for Spring and Summer 2010 and wanted to share my finds with you. Drop earrings are very popular with stars like Reese Witherspoon and Penelope Cruz. Coordinating with a variety of clothing and styles, drop earrings work for day or night. This type of earring is an updated classic and blends with any style. Just like statement necklaces are still big, statement earrings are popular, especially for evening. (Just be sure to not wear the statement necklace and the statement earrings at the same time!) Make a big statement with these Flora Chandelier Earrings in Sterling Silver and Vintage Pink Lucite Filigree from Caroline Grace. 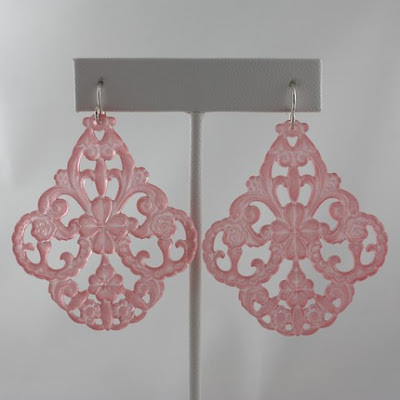 Chandelier earrings are a huge trend in jewelry right now. The bigger, the better. 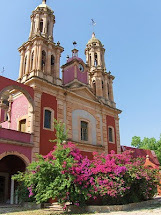 And this gorgeous pink color will match all of your Lilly. Many of the most exciting jewelry is inspired by nature. 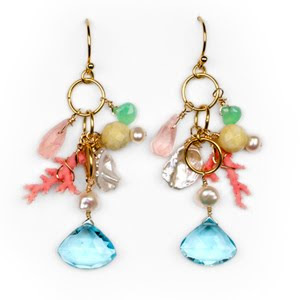 These Sea Candy earrings from Meg Carter designs are a gorgeous tribute to the natural world and are a great statement piece. Turtles are big too, this season. 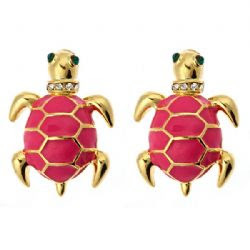 You can find these adorable turtle earrings at Fornash. Also available in blue and green. Other popular earrings use other natural materials such as wood or shells. Of course, you know that you can never go wrong with a simple pair of gold hoop earrings or simple pearl studs. P.S. Happy April! 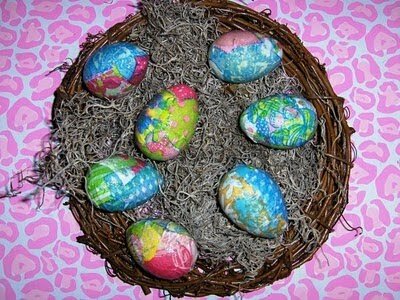 Be sure to head over to my facebook page for a chance to win these cute Lilly eggs that I made a little bit ago. All of the details can be found on the facebook page. I love statement earrings. Those pink ones are fab! Oh I just LOVE the turtle earrings. :) They are so cute! And I love CGJ's chandelier earrings too. They'd get a lot of use in my wardrobe! Her jewelry is so classic. I love those turtle earrings. They are adorable! Those turtles are oh-so-cute! And I adore the seaside candy pair too! What cute little turtle earrings! Oh... and what comment did you remove??? EEEEEK!